Pacifica Spray Perfume Persian Rose is a blend of Bulgarian rose, subtle violet, myrrh and delicate fruit is a nod to the floral empire of the Persians, the kings of perfume in the 9th century. Spiritual, elegant and classic. 100% vegan. Fun, fresh and fantastic, Pacifica Spray Perfume is made with natural denatured alcohol and Pacifica`s signature fragrance blends with essential and natural oils. Classic and elegant with Bulgarian rose, subtle violet, myrrh and delicate fruit. 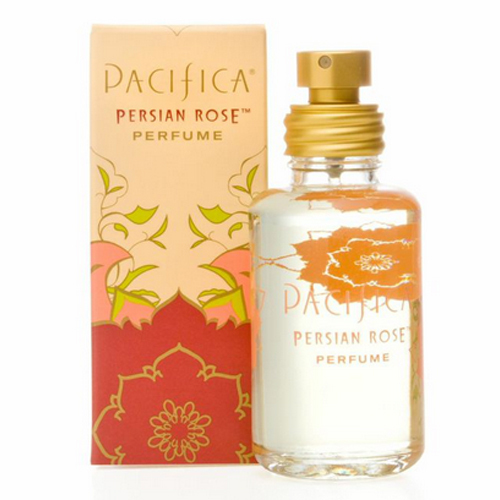 Below are reviews of Pacifica Spray Perfume Persian Rose - 29ml by bodykind customers. If you have tried this product we'd love to hear what you think so please leave a review. Pleasent floral scent with citrusy high notes which settles down to a sweet rosey smell. Lasts for at least 4 hours on my skin as proved by comment from others (nice comments!). The bottle comes without a lid which means it wouldn't be awfully good in a handbag - you'd need the roll-on for that. Layers nicely with the balm-type Persian rose. innocent, cruelty-free and gorgeous, it makes me feel great every day. What more can you ask for from a perfume? I did a detox about 5 years ago and many perfumes repel me since then. This perfume is an exception, smells natural and seems to have longevity (always getting complimented on it) I love it! It may be unfair on the product as others have liked it but I felt sick when smelling it, far too strong and despite loving rose scent, this was not a rose scent I could ever cope with and had to return it asap for a refund. I felt unwell with it for at least 30 min but as I said, this may be just me. I really love this perfume, more like roses than any other rose perfume, but I do wish it was in larger bottles. A wonderfully natural scent. As subtle or heady as you want it to be depending on how many sprays you use. calming and comforting. I've had so many compliments since wearing this.